Apple City to Be Designed by Norman Foster? News came out recently that Apple had bought HP’s old campus in Cupertino. For exactly what reason, we common people can only make informed guesses. It does seem logical, though, that this property will eventually be transformed into a new campus for Apple. While that in itself is not something one should spend more than one second of thought on, the rumors details surrounding the “mystery” campus just might pique your curiosity. Architecture enthusiasts will certainly recognize British architect and designer Norman Foster. He is arguably the most known builder of landmark office buildings in Britain, and his company has worked on countless high profile projects all over the world. From the IBM pilot head office in the UK to the Carre d’Art Nimes in France to the Hearst Tower in New York to the Expo MRT Station in Singapore – this is only a handful of what this man has achieved. In the next year, he just might have another groundbreaking project to take on: the building of Apple City (yes, that is the rumored name of the new campus). While nothing has been confirmed yet, rumor has it that Apple City (I don’t know about you, but there is something that doesn’t sound quite right here) will be based on the concept and design of Masdar City in Abu Dhabi. This city holds the distinction of being the first city without cars and carbon emissions, and this is what Apple City is going to be, if the rumors come true. 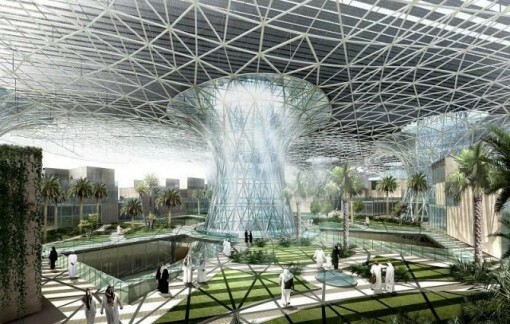 I didn’t know about Masdar City before I read about this piece of news, but it does look awesome, doesn’t it? And, I am sure that if Steve Jobs gives Norman Foster the go signal (now that is another story altogether), Apple City just might be THE place to be/see.